How many times have you walked past somebody living on the streets in your neighborhood and felt conflicted, guilty, afraid or just not sure how to help? Sometimes people are also "worried they might inadvertently hurt somebody by giving them money," says Rose Broome, co-founder of a crowdfunding site for "homeless people and neighbors in need" called HandUp. 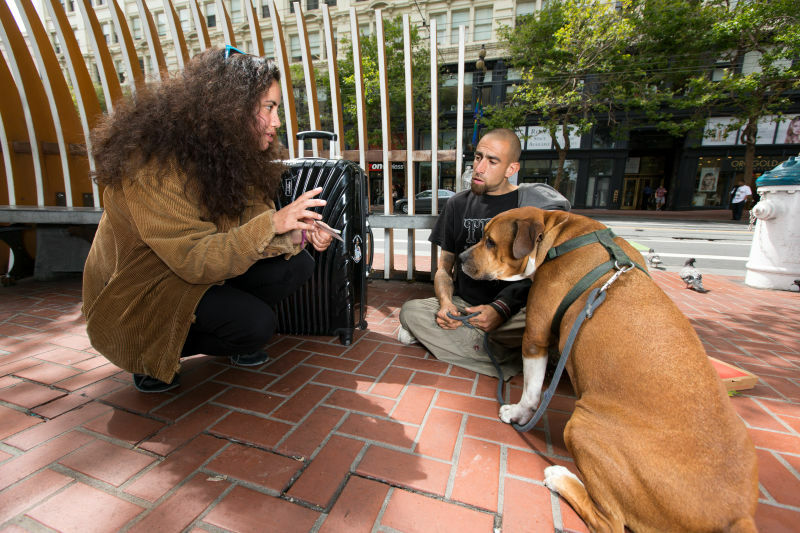 This week HandUp launched a program in San Francisco it hopes will empower people to do something about homelessness -- and start a conversation with someone in need -- by giving them a $25 gift card. Now, $25 is obviously not going to end someone's homelessness, explains Emily Cohen of Project Homeless Connect. However, because it can be redeemed only through HandUp's partners, what it's going to do is begin a relationship with a social service provider. "They're going to trust us for some of those harder conversations: housing, mental health, addiction recovery," says Cohen. "We really see the gift card as the engagement tool to start those other conversations." Cohen says people who are homeless sometimes hesitate to seek services for a number of reasons. They may not know what's out there or don't think an organization can meet their needs. But with a gift card that can be exchanged for basic needs, like food or clothing, or put into a savings account for dental or pet care, Cohen says donors are giving that person something of real value. The card, which can be purchased online and is then sent in the mail to the buyer, includes instructions and a map to Project Homeless Connect's office. It says: "Your neighbor gave you this gift card because they care about you." HandUp has been testing the cards for several weeks. Cohen described how a young woman who was given a card came into the project's daily drop-in center on Van Ness Avenue near Market Street last week confused about what it meant. "There's a little bit of disbelief," says Cohen. But they had a conversation about the wide variety of services Project Homeless Connect provides, and the woman wound up being excited not just about the gift card, but about the possibility of getting prescription glasses. "HandUp offers us the ability to say yes, when there's often so many no's in our social safety net," says Cohen. So far, Project Homeless Connect is the only partner through which the gift cards can be redeemed. Ideally, though, HandUp would like to make the card redeemable at agencies throughout the city, and potentially at single-room-occupancy hotels. "Here in San Francisco, homelessness is becoming more and more visible and the community is asking why, what's happening and what can we do?" says Broome. "We have a responsibility to help our fellow citizens." The city's latest homeless count found more than 3,500 people living unsheltered, meaning they are living on the streets, in vehicles, encampments or other uninhabitable places. More than 7,500 people reported being homeless, including families and children, and a majority said they were living in San Francisco when they lost their homes. HandUp, which launched nearly two years ago, allows donors to give money directly to individuals, who earn points that are redeemed through one of the company's social service providers. Donors can read people's stories and help them reach their goals. So far, the public benefits corporation has helped nearly 1,000 members meet 3,600 goals, mostly in the Bay Area, with more than $850,000 in donations, says Meghan Murphy, the company's marketing director. HandUp has 11 partners in the Bay Area. Broome sees the gift card going national. The company has a partner in Detroit, and the card is currently being tested in Oregon and Washington. Bevan Dufty, Mayor Ed Lee's point person on homelessness, says he's donated to HandUp members and called it a great resource. "I think it really humanizes and connects people. Sometimes just a little bit of money can be a big change," he says.